The single split hash line conveys both the juxtaposition and harmonization that is our name. 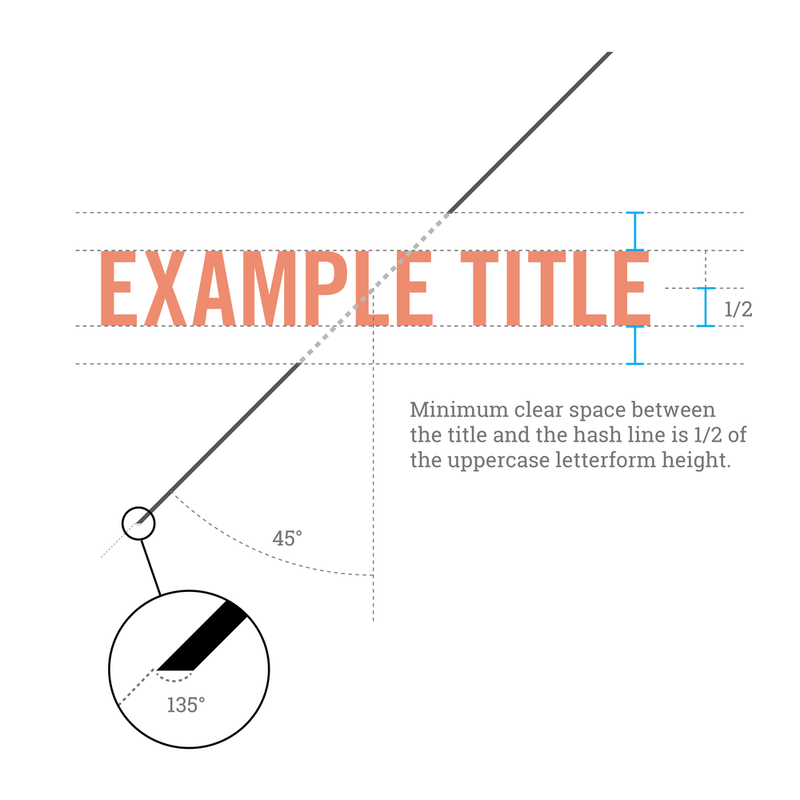 As a graphic element, it can be used to highlight an important section title or phrase. The hash is set at a 45° angle and the top and bottom edges of the strokes should be beveled to 0° (horizontal) if at all possible. The hash line can either be short or extend all the way to the edge of the page or slide. In order to give the type room to breathe, there should be no less than half of the uppercase letterform height as clear space. The minimum stroke weight for the hash line is 0.5 pt. The hash patterns consist of strokes set at a 45° angle and spaced evenly apart. To allow for more visual flexibility, there are two variations of the hash pattern. The consistent hash pattern is made up of strokes that are a single weight representing the consistency that successful branding establishes. The evolving hash pattern is made up of strokes which increase or decrease in weight as the pattern progresses. This is representative of the evolution and forward momentum that takes place as we help develop brands. Voice a statement with the callout box. It remind us that we are ultimately humans striving to engage other humans. Use it as a vehicle to differentiate a set of information or call attention to a word/quote/phrase. The callout box is made up of two components—the box and the caret. The box always has squared corners and can occur as a basic rectangle or a more complex shape that conforms to the type it contains (see example to the right). The caret has been created from a square that has been rotated 45° and has its center point placed on the perimeter of the box creating a rudimentary arrow. The hash grid symbolizes how our process of assessing brand challenges leads to our development of successful brand solutions. Using the hash pattern, we can extrapolate a quasigrid based on the 45° angle that is used throughout the system. This grid offers another option for housing information, incorporating more brand elements or simply adding more visual interest to a page. This can be implemented in a variety of ways with the only rule being to never allow the intersection to occur dead center on the page/screen.